Forced into the deep oceans by a Great Flood that occurred countless centuries ago, humanity now lives trapped under a thick layer of unbreakable ice and their survival hangs by a tenuous thread. However, their penchant for perseverance is strong, and a new civilization has emerged with distinct kingdoms, religions and cultures. By a twist of fate you, an aspiring submarine captain, have been given the honour of commanding your first sub. With a brave crew at your command, you now venture into the unknown on a quest to discover humanity’s greatest secret. A Beautiful Underwater World to Explore: Three massive and beautifully realized open sea zones to explore, each with their own factions, local stories and more. 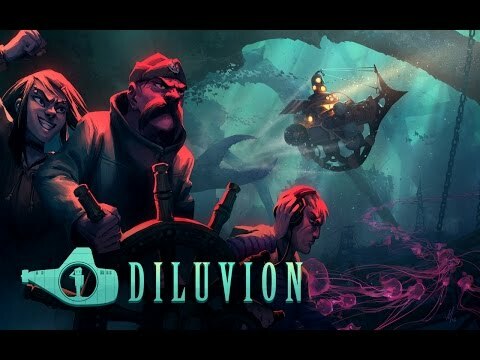 Innovative Combination of 2D & 3D Graphics: Experience the mysteries of the deep in beautifully rendered 3D graphics as you navigate your submarine, and seamlessly switch to meticulously hand-painted 2D graphics when exploring towns and cities. Thrilling Real-Time Submarine Combat: Utilize an arsenal of underwater weapons to engage in life-or-death firefights with other submarines and deadly terrifying creatures. Upgradable Submarines: Continuously improve your vessel by acquiring new weapons that can dramatically change the tide of battle, and gain access to new areas by increasing its dive depth by collecting hull armour plates. 9 Pilotable Submarines: Explore the world to uncover 9 unique pilotable submarines, each with their own feel, strengths and weaknesses. Resource Management: This world is not for the faint of heart, as resources are limited and survival is a constant battle. You’ll have to actively manage your food supplies and oxygen levels should you wish to keep your crew alive and overcome the perils of the sea. Terrifying Underwater Foes: Explore the world and test your bravery against giant sea creatures and mysteries undersea anomalies!